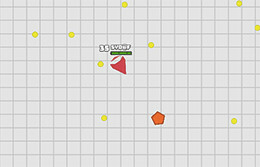 Sl4ash.io is an awesome online game that can be played among multiplayers or 2 players. The game is set in an arena where a player is identified as a cursor. Opponents are also shown in colourful figures roaming around. You have to attack your opponents by ramming into them using controls. Sl4ash.io is a fairly simple game but quite interesting given its nature. You start off the game by choosing your figure. You can choose Blue, Scout, Frozen, Flame or Assassin. Each one has a certain set of skills that vary. You can choose any of these figures according to your preferences. For instance, Frozen causes the most damage, while Scout can see the opponent coming from the most distance. After choosing an appropriate figure, you just have to enter a name you will be identified with in the game, and start playing. The rules of the game are simple. You have to attack opponents while maintaining your health. Bars are visible on the screen indicating your overall health. You have to make sure you dash into the opponent and cause damage. If you miss, the opponent will seize the chance and attack you. Depending on damage your figure can sustain, you will have time to fight back or dash away. If you do not do either of those, it is possible your opponent attacks you too many times and your health bar finishes up. This will lead to elimination. If you attack one opponent many times or many opponents at once, you will be gifted with an X4 combo that will help restore or upgrade your attacking essentials. You can control your figure with mouse. Tao your keypad or click the left key of mouse to dash into an opponent. Right click can activate your shield if you want to protect yourself from an oncoming attack. Beware the shield and the dash activity is limited. You will have to upgrade to regain your privileges.